It must be obvious to regular readers of The Book Chook (bless you all!) that I love great children's picture books. Part of the reason is that these books are so important in raising children who love to read. If we can share bright, beautiful and engaging stories with our kids from the time they are babies, we are helping them love to learn and succeed at school. I Spy Mum is just such a bright, beautiful and engaging picture book! Written by Janeen Brian and illustrated by Chantal Stewart, it was published by New Frontier Publishing (2010). 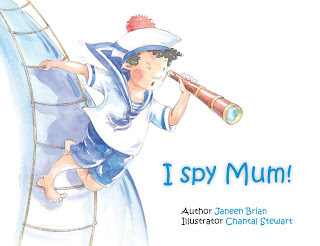 I Spy Mum would make a great companion for Brian's I Spy Dad, which I reviewed here at The Book Chook, and which has been shortlisted for the Speech Pathology Book of the Year Award. Both are typical of Brian's rhyming picture books - a strong rhythm, impeccable rhyme, and above all, FUN! Fun to read aloud, fun to share with kids, and fun to discuss and respond to. Stewart's illustrative style is perfect for the book. There are lots of lovely visual details to pause and ponder over - like the dabble-drawing mum, who has paint brushes skewered into her bun and green streaked hair. I Spy Mum is an ideal choice for students studying the family, for Mothers Day, or simply to celebrate the wonderful people our mums truly are. This one sounds so good-I love good rhymming choices. Me too, Michelle. I predict you'll love this one! What a sweet book! This is a good one to recommend to parents, it would be a fun one to read as a family. I think so too, Kelly! We are past well these lovely picture books now, but we still own a bookcase full of picture books. We just can't let them go. The reason for that is just as you describe: they were so important in raising our daughter and feed her love for books. What should I do? Make a selection and keep them for (possible) grandchildren? Donate them to poor kids? What did you all do?